United Methodist Women is the largest denominational faith organization for women in the world! With the main emphasis to be in mission to women, children and youth, the UMW provides opportunities and resources to grow spiritually, become more deeply rooted in Christ and put faith into action. St. Paul’s UMW is an active group of more than 70 women. Four circles, meeting at a variety of times, are available and all women of St. Paul’s are invited to choose a group to attend. They will find a warm group of women to connect with through an emphasis on prayer, study, mission projects and having great time! 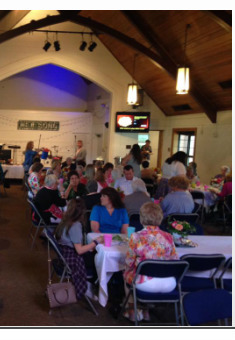 UMW as a whole meets or works together several times a year for special events such as the Spring Chicken Salad Luncheon, Call to Prayer and Self Denial Service, Easter Baskets for Shut-ins, June Salad Luncheon, Congregation Care Gift Bag Christmas Party and more! Circle of Friends is a younger women’s prayer group that meets on the second Sunday of the month at 5:00pm in the parlor. Joy Circle is for all ages and meets in homes at 6:00pm on the second Tuesday of each month. A book is chosen by the group to study and members take turns leading after a light supper. Harmony Circle is for all ages and meets in homes at 6:00pm on the third Thursday of the month. Mary Lou Blakeman leads the study after a light supper. Mary Henry Circle is for all ages and meets in the church parlor on the fourth Tuesday at 9:30am for refreshments and a study.